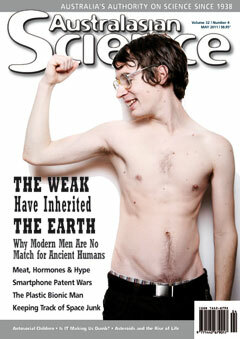 The superior strength, endurance and eyesight of ancient humans reveals that the weak have now inherited the Earth. New technology is untangling the complex network of patents at the centre of a litigation war between smartphone companies. Feature: Hormones In Meat: Science or Spin? Lack of interest in holding a mother’s gaze may be an early indicator of problems to come, such as serious crime, violence and drug-taking. Satellites are under threat from about 500,000 pieces of space junk, but new Australian technology can now track the orbit of debris as small as 1 cm to within 1 metre. Plastics that conduct electricity could bring the bionic man from science fiction to reality. An asteroid impact in southern Australia is redefining the conditions that preceded the explosion of multicellular life more than 500 million years ago. Medical research funding has been saved: now we need to spend wisely. Once again the Federal Budget treated science as discretional spending rather than a key to the nation's competitiveness. What’s in the night sky this month? In an age of information abundance there is a deficit of wisdom. Astrophysics and banking have a lot more in common than you’d ever imagine. It’s time to review how government receives its scientific advice following the resignation of Chief Scientist Penny Sackett. Building an effective and self-supporting network of conservation research professionals across the region could prove to be Australia’s greatest biodiversity legacy. Dominant crickets sing to attract mates, but if they lose a battle and become subordinate they fall silent and rely on body odour. Experts answer questions about the carbon trading scheme announced by the Australian government. Australia is lagging behind the rest of the world in setting fuel efficiency targets for new cars. Science is a search for truth, but three filters can prevent the truth from being recognised. Dave Reneke brings news from the space and astronomy communities around the world. War turns the ethics of doctors on its head. The buck stops with “ordinary taxpayers” when it comes to paying for carbon emissions. Australians have featured prominently in lists identifying the most cited chemists of the past decade. Online Feature: Budget: Did universities get their fair share? Stronger higher education spending will help Australia become a ‘clever country’. An international team has for the first time photographed a planet in the process of formation. The finding confirms long-standing theories of how solar systems evolve, and opens the door to a range of exciting further research. Dangerous bacteria may be evading water treatment plants and getting into our drinking water by colonising amoebae, according to research at the University of NSW Water Research Centre. Medical researchers have launched a campaign in response to rumours of large cuts to science funding in this year’s Budget. Public outrage over Pluto’s demotion as a planet has inspired a unique attempt to engage the public in astronomical decision-making. Mice with hearing loss have experienced a partial recovery after being treated with nasal stem cells.